The plug-in adds a menu item "Help -> Check for Updates...". When you choose this menu item starts the search for new versions of the program and plug-ins, and if they are found, a message window appears with a list of what updated. When you click on a link to a page where you can download the latest version of OutWiker or plug-in. 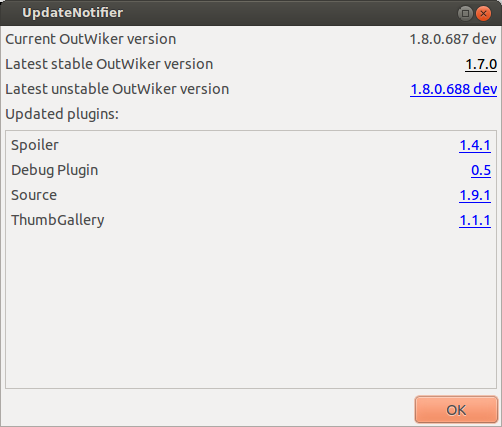 In the plug-in settings ( Edit -> Preferences -> UpdateNotifier [plugin]), you can specify the interval at which the plug-in will automatically check for updates, select whether to notify the release of the next "unstable" versions OutWiker. Plug-ins can be Installed/Updated/Deleted through the OutWiker interface. The way of detection of new versions is changed. When using OutWiker 1.8 you can set a hotkey to check for updates.